***KINGSTON, NY*** 43 Lovebug 2 year old NEVILLE is looking for a Foster or Adopter to take her home! 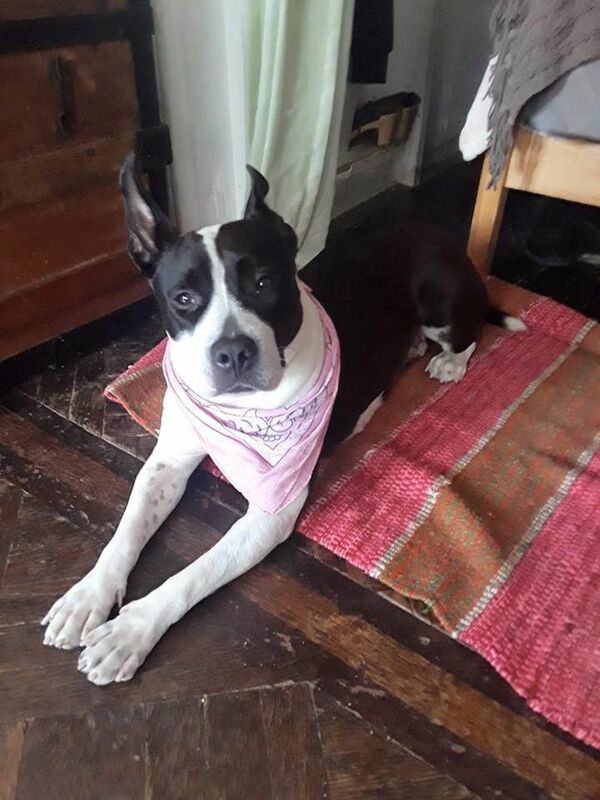 We don't have an AmsterDog newspaper but if we did, this beautiful girl Neville would be on the front page because we need to get her a home pronto. Neville, the Hawaiian Pineapple pizza of dogs, the indie rock band of pups, the Williamsburg of pooches, is differently delicious, enticingly edgy and crazy cool. Part pretty pittie, part little lovebug, Neville, has a neurological disorder that doesn't impact her lust for life one darn bit. It just looks like she's bopping to to the beat a little. We think it makes Neville that much more adorable and one in a million. It doesn't stop her from being one happy pup. And it doesn't stop her from dreaming of a home of her own. Or a pair of feet she can put her head on after a day of doing her favorite thing, running around in a big yard. Or giving kisses to her mama or daddy while she convinces them to give her treats. Or maybe even another dog brother or sister but we don't know about other dogs yet. What we do know, is this pup is just like all of us, looking for true love and for someone who sees it when they see her beautiful face. At the end of your day, no promotion, no new pair of shoes, not even really good pie is going to make you feel as good as the love of a pup. And Neville is a certified perfect pup. So call us! Email us! Message us! Neville can't use the computer so we will respond for her. Neville is spayed, up to date on shots and microchipped. Any vet expenses will be completely covered. For more info on this outstanding girl, please message AmsterDog at 917 689 8414 or go to our website to fill out our online application, www.amsterdog.org Thanks for caring about a pet in need!